2 Is There More Than One Sun? Because Those Shadows Don’t Match Up! 3 You’re in Space… Then Where Are the Stars? 5 Carved by Nature… Why Does That Rock Have a "C" Drawn on It? 7 What’s That I Can See Reflected in Your Helmet? “That’s one small step for [a] man, one giant leap for mankind.” So said Neil Armstrong on that momentous occasion on July 21, 1969 when he stepped onto the surface of the moon for the very first time…supposedly. Does anyone else find it strange that decades before the internet, nanotechnology and cloning, NASA were able to build a rocket that could not only land on the moon, but live broadcast the event to 600 million people? Was the moon landing fake? The 60’s was a decade where technology was only just figuring out how to develop the computer mouse, so it’s not surprising that many people question the authenticity of the moon landing. 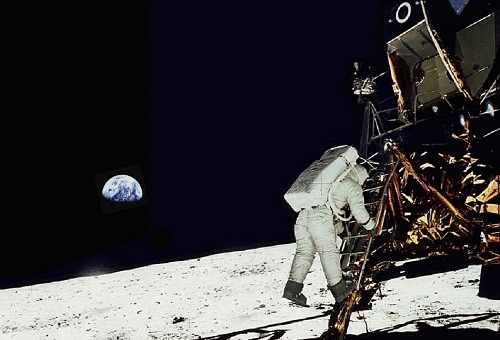 Here are the top 8 lines of evidence exposing the moon landing hoax. 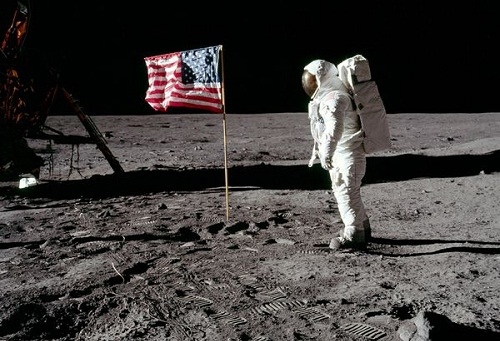 It’s an iconic image for the citizens of the United States of America: their flag, planted on the moon and waving gently in the breeze. Only, there is no breeze on the moon, meaning there is no air in the moon’s atmosphere, and hence, there is no wind whatsoever. 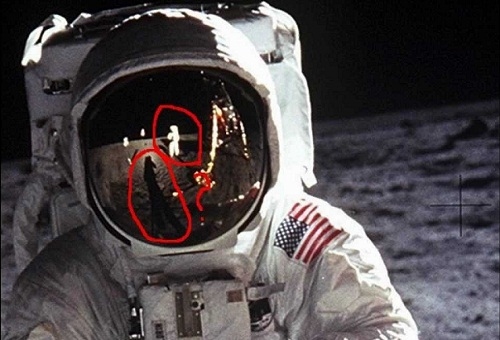 This is one of the most obvious stuff ups in the staged moon landing hoax. Of course, NASA tries to get around this by saying it wasn’t blowing in the wind, it was just a bit crumpled from being rolled up on the journey…Well, judge for yourself. Is There More Than One Sun? Because Those Shadows Don’t Match Up! NASA produced an abundant supply of photos and video footage to support their moon landing. 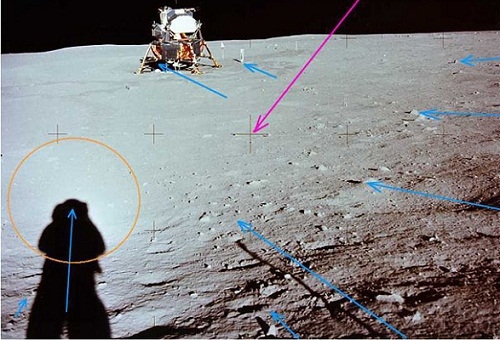 But, it soon became evident that there was something a bit fishy about these photos on the moon; ever noticed that the angle of the shadows do not match up? Shadows are caused by light sources. On the moon, there should only be one light source: the Sun. So, logically, all shadows should be parallel to each other. Only shadows in the photos of moon landing are not. In fact, the shadows in many of the photos run in different directions. It’s almost as if the shadows are caused by… yes, multiple lights on a film set! You’re in Space… Then Where Are the Stars? On a cloudless evening, you can see an abundance of twinkling stars in the night sky. Surely from the moon, with its lack of clouds and complete absence of artificial light, you should be able to see even more stars with the naked eye? Only, you can’t. In fact, in all of the photos taken during moon landing, you cannot see a single star. Not one. Sure, the photos taken in the 60’s weren’t amazing quality, but these days you can capture the stars in a photo taken from your phone, so shouldn’t the high tech NASA cameras have been able to pick up something? Carved by Nature… Why Does That Rock Have a "C" Drawn on It? In yet another example of the technicians on set just being sloppy, one of the moon landing photos shows a “moon rock” which has a perfect letter ‘C’ printed on it. The perfect symmetry of the letter shows that it is not naturally occurring. Now, it’s perfectly credible that a prop used on a film set would be marked with a reference letter. 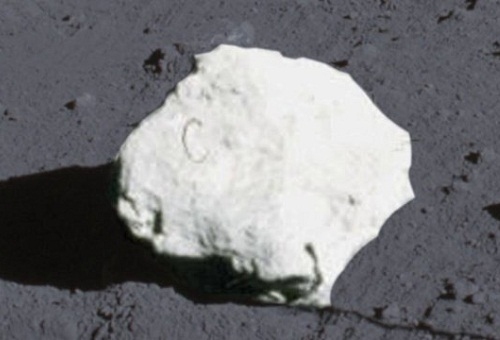 But there is no plausible argument for the “C” just being naturally weathered into the surface of the rock. As a result, NASA came up with a different, though no less implausible, explanation for the rock with the “C”. According to them, it’s a stray hair. It can’t be more ridiculous than this! Everyone knows how dangerous radiation can be: overexposure to it can cause radiation poisoning and even death, so It is should be avoided at all costs. To get to the moon, you have to fly through a band a radiation known as the Van Allen radiation belt. Yes, the space craft had an aluminum coating, but is that really enough to protect a human being whilst they spend over one and a half hours traversing a band of radiation? NASA, of course, said “yes” and that the astronauts weren’t in the radiation for all that long. But an hour and a half still sounds like a pretty long time to be inside a cosmic microwave. What’s That I Can See Reflected in Your Helmet? When the photos were published of the Apollo 12 moon landing, many people noticed something a tad unusual reflected in the shiny helmet of an astronaut. It appeared to be something hanging from a wire or perhaps a rope. In fact, it looked suspiciously like an overhead spotlight, the kind you see used in Hollywood movie studios. Whilst admittedly, the photo quality is a bit grainy, making it impossible to positively identify the object. It still begs the question: what could possibly be suspended in midair on the moon? There should be nothing there for anything to be hanging from! 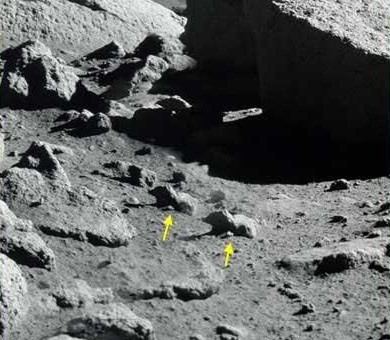 Have you ever seen the photos of the astronauts footprints embedded in moon dust? The astronauts described this dust as being similar to “talcum powder or wet sand”. That being the case, why is there no sign of impact where the lunar module landed? You’d think that a rocket-ship landing on a big pile of talcum powder would leave some kind of impression in the surface, but according to the moon landing photos, no such evidence exists. In fact, it looks more like the lunar module was just placed in position. 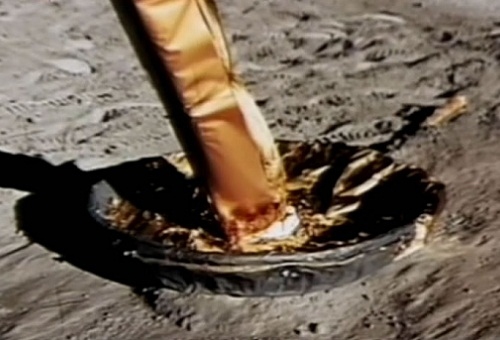 This is just yet another blindingly obvious defect in the details of the moon landing hoax.